Strategic Plans are most powerful when they arise from a wide range of community groups. The latest thinking around Strategic Plans is they evolve into ongoing Strategic Thinking rather than plans set up once every five to ten years. It is with this new thinking Good Shepherd Episcopal School created our Strategic Priorities. We began by engaging our community more deeply in our Self-Study process leading to our re-accreditation. Adjusting the typical process, we incorporated Human-Centered Design (HCD) elements, which emphasize “a first-hand understanding of the human needs and behaviors in the system you are designing, followed by decision-making that is based on that understanding.” Most importantly for our Strategic Priorities, human-centered design produces “a bias toward action,” meaning the Self-Study can be a launching pad for purposeful, intentional actions based on results. After completing the extensive HCD work, we had identified eleven opportunities or challenges, which we called “How Might We” (HMW) statements. These HMW statements were incorporated into each section of the Self-Study, along with future Plans and Priorities. As each Self-Study committee completed their work, and addressed their Plans and Priorities through the HMW statements, we collected and assessed everything to create our Strategic Priorities. 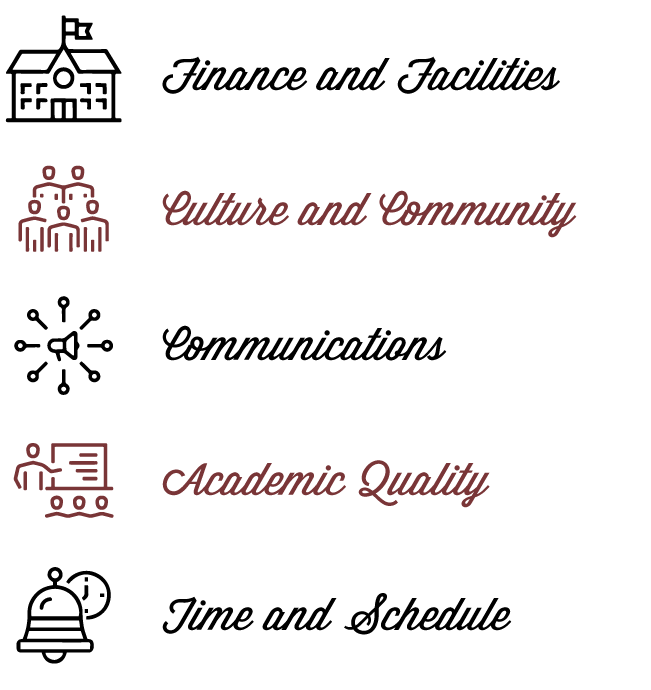 Ensuring these Strategic Priorities were part of ongoing strategic thinking rather than a lock-step plan for the next decade, we divided our priorities between the Board of Trustees and the School, and then broadly prioritized our actions. We have maintained latitude to continue to assess our next steps as we move forward, and we will continue to address additional priorities as we have capacity.